Last month I released 8bit-Slicks for the C64, Atari XL and Apple//e. It is the first cross-platform online game for 8bit era computers. While developping the game, I organized my project into a "game" part, and a "SDK" part, for future re-use. It then occured to me that other people would benefit from this base for development of cross-platform 8bit games. So I am announcing the planned release of 8bit-Unity in the second quarter of 2019. The SDK will contain everything to let you create simple online 8bit games in C code once, and deploy on all supported platforms easily (C64, Atari XL, Apple//e, and more in future!). ¿This project is like the Cross-Chase of Fabrizio? the "universal" 8-bit game "Cross Chase" that has to be a fun and that should run on (nearly) ALL 8 bit computers, consoles, handhelds and scientific calculators. The game will be the proof of concept of how flexible the library is. The main goal is to get the library and game to work on most 8-bit architectures but other systems are also considered. We also support any current architecture for which GCC can produce a working binary. the APIs do not depend on the game code. Therefore it must be possible to re-use the same library for other games/programs. ACK for PC 8088/8086, CP/M Intel 8080, Linux 386/68K/PPC/MIPS, PDP11 (https://github.com/davidgiven/ack). WinCMOC for 6809 targets (https://sourceforge.net/projects/cmoc-win32/). WinCMOC has been abandoned because it uses an old CMOC version that has broken pointer to functions and because it is no longer maintained by its author. TIGCC for 68k-based TI calculators (http://tigcc.ticalc.org/). Some target(s) may get specific graphic code with re-defined characters, software/hardware sprites and music/sound effects. For most targets, more than one version is built, in order to support different hardware configuratins and expansions (e.g., memory expansions, second CPU, 80-col display card, etc.). Remark: You can compile the game for any recent or old/ancient architecture for which there is an ANSI C capable compiler. Fabrizio's project has a different goal. Being a simpler game is easier to port to nearly every platform out there if it's previously supported by the z88dk project. I've been helping him with the 80-columns EInstein port. Anyway, a SDK for cc65 is always welcome and the Unity's features are impressive. Sprites not only for machines with hardware support?, now we're talking! I was not aware of Cross-Chase, thanks for sharing this information Explorer, it will sure be a source of inspiration! My goal with 8bit-Unity is to make an integrated IDE with all the needed tools for processing assets and packaging disks. Developping simple games with static bitmap background, animated sprites, and online gameplay should become a breeeze. As I told on the 8bit-slicks post, this is simply amazing! Thank you very much for the hard work and keep us posting the advances. Is there any screenshot of the IDE? Quickie escribió: Is there any screenshot of the IDE? Don't expect much for version 0.1... Just Notepad++, Gimp, and some batch files! But I plan to work on this for a few years, and it will sure have all the bells and wistles in due time. 8bit-Dude escribió: I was not aware of Cross-Chase, thanks for sharing this information Explorer, it will sure be a source of inspiration! The CPC Amstrad people have the CPCtelera (join 'CPC' and 'coctelera' -shaker-), and it is not hard to expand to another targets because they use standard tools. 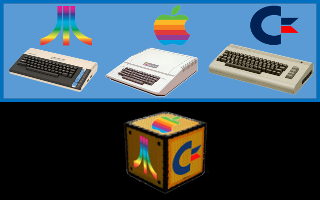 For integrated IDE, I use WUDSN IDE, a free integrated Apple II, Atari 2600, Atari 7800, Atari 8-bit, C64 and NES development plugin for Eclipse (features). So my project is about a universal library that can be used to code simple games with simple graphics and even simpler sounds. 8bit-Unity allows to exploit a few different targets almost as if coded one by one. So it can be used to create games with full-fledged graphics and sounds.